1. Armed Forces Hospital. Brasília-DF, Brazil..
2. Catholic University of Brasília. Brasília-DF, Brazil. This case study describes a 71-year-old man with signet-ring cell gastric adenocarcinoma and malignant sigmoidal polyp; and typical features of Saint’s triad and Heyde syndrome. He had digestive bleeding, two types of hernia, diverticulosis, arterial hypertension, malignant polyp, and antecedent of smoking, lung tuberculosis, and surgical correction of aortic valve stenosis. There is a hypothetical inverse relationship between herniosis and development of malignancy; however, the patient herein described presented gastric and sigmoidal cancers. Gastrointestinal malignancies are sometimes associated with paraneoplastic entities, isolated or manifested as syndromes, but neither Saint’s triad or Heyde syndrome have been included. This patient persisted clinically stable during the preoperative period, but suddenly died; Trousseau’s syndrome would be the most probable mechanism of sudden death in this setting. Case reports can stimulate further studies to get additional knowledge about unusual entities. Keywords: Adenocarcinoma; Carcinoma, signet ring cell; Hernia, hiatal; Diverticulosis, colonic; Cholelithiasis; Aortic valve stenosis; Angiodysplasia; Anemia, iron-deficiency (source: MeSH NLM). Este estudio de caso describe un hombre de 71 años de edad, con adenocarcinoma gástrico con células en anillo de sello y un pólipo maligno sigmoideo; y características típicas de la tríada de Saint y del síndrome de Heyde. Tuvo una hemorragia digestiva, dos tipos de hernias, divertículos, hipertensión arterial, y pólipo maligno; con antecedente de tabaquismo, tuberculosis pulmonar, y corrección quirúrgica de estenosis de la válvula aórtica. Hay una hipotética relación inversa entre hernioses y el desarrollo de malignidades; sin embargo, el paciente que se describe en el presente documento presentó cánceres gástrico y sigmoideo. Neoplasias gastrointestinales se asocian a veces con entidades para neoplásicas aisladas o manifiestan síndromes, pero ni la tríada de Saint ni el síndrome de Heyde se ha incluido. Este paciente persistió clínicamente estable durante el período preoperatorio, pero de repente murió; síndrome de Trousseau sería el mecanismo más probable de muerte súbita en esta situación. Los informes de casos pueden estimular más estudios para obtener un conocimiento adicional sobre esas entidades inusuales. Keywords: Adenocarcinoma; Carcinoma de células en anillo de sello; Hernia hiatal; Diverticulosis del colon; Colelitiasis; Estenosis de la válvula aórtica; Angiodisplasia; Anemia ferropénica (fuente: DeCS BIREME). Gastric malignancy may be diagnosed before or after development of associated conditions including acanthosis nigricans, DIC, disturbances of the central nervous system, Krukenberg tumor, microangiopathic hemolytic anemia, neuromyopathy, and the Trousseau’s syndrome (1). Signet ring cells gastric adenocarcinoma (SRCGA) is characterized by at least 50% of SRCs in the tumor samples, and the prognosis of this type is poorer than that of the non-SRCGAs (2). These tumors are frequently related to thrombophilic tendency, phenomenon that increases the morbidity and mortality rates and can play a role in sudden deaths in these patients (1,2). Saint’s triad (ST) initially included hiatus hernia, colonic diverticulosis and cholelithiasis; currently, other changes as gallbladder anomalies, hydropic gallbladder, acute or chronic cholecystitis, hernias or diverticula of small intestine, and aortic aneurysm are involved (3-5). The hypothesis about common causal pathogenic mechanisms related to these changes include "herniosis" and abnormal connective tissue remodeling and enhanced degradation (3-5). Aging, hypertension, chronic obstructive pulmonary disease and diabetes are related to ST (3-5). Worthy of note is the controversial inverse relationship between herniosis and malignancies (3). Heyde’s syndrome (HS) includes aortic valve stenosis, angiodysplasia with gastrointestinal bleeding and iron deficiency anemia; secondary type 2A von Willebrand disease may occur (6,7). Confirmation of decreased heaviest vWF multimers by gel electrophoresis is not mandatory, because the coagulopathy may be absent in patients with aortic gradients below 50 mmHg; moreover, the high cost procedures may be unavailable in developing countries (6). In the majority of cases, the aortic valve replacement can prevent recurrences of bleedings (6,7). 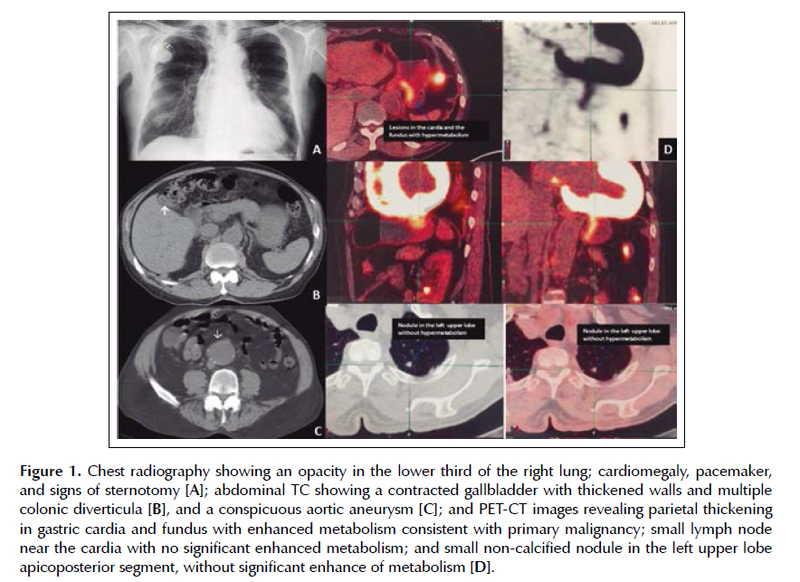 This case study describes an elderly man with gastrointestinal malignancies coexisting with indicative features of ST and HS, and the hypothesis of the associations is here in commented. A 71-year-old man was admitted because of fever (38.5ºC), breathlessness, cough and hemoptysis, in addition to enterorrhagia and melena. Antecedents included inguinal hernia, pulmonary tuberculosis, hypertension, atrial fibrillation, coronary disease, heart failure, hypothyroidism, dyslipidemia, prostatic hyperplasia, and Broca’s aphasia due to stroke. Moreover, five years ago he underwent a biological valve replacement due to aortic stenosis, and concurrent myocardial revascularization. He was in regular daily use of rivaroxaban 15 mg, losartan 50 mg, carvedilol 6.25 mg, simvastatin 20 mg, spironolactone 25 mg, furosemide 40 mg, and levothyroxine 50 mcg. He was tobacco smoker (10 pack-years) till 20 years ago. Physical examination showed BMI of 23.8 kg/m2 and 95 cm of abdominal waist; pale skin and mucosa (++); irregular heart rhythm, hypophonetic sounds, and a mitral systolic murmur. The rest of the physical examination was unremarkable, including the normal rectal touch. Laboratory determinations are showed in Table 1. Plain chest radiography showed discrete opacity without clear limits in the lower third of the right lung; and a pacemaker (Figure 1A). Abdominal TC images showed a contracted gallbladder with thickened walls and multiple colonic diverticula, in addition to a conspicuous aneurysm of the aorta (Figures 1B and 1C). With respect to the source of bleeding, both upper digestive endoscopy and colonoscopy were performed aiming to disclose its location, which could be accessible to endoscopic treatment. 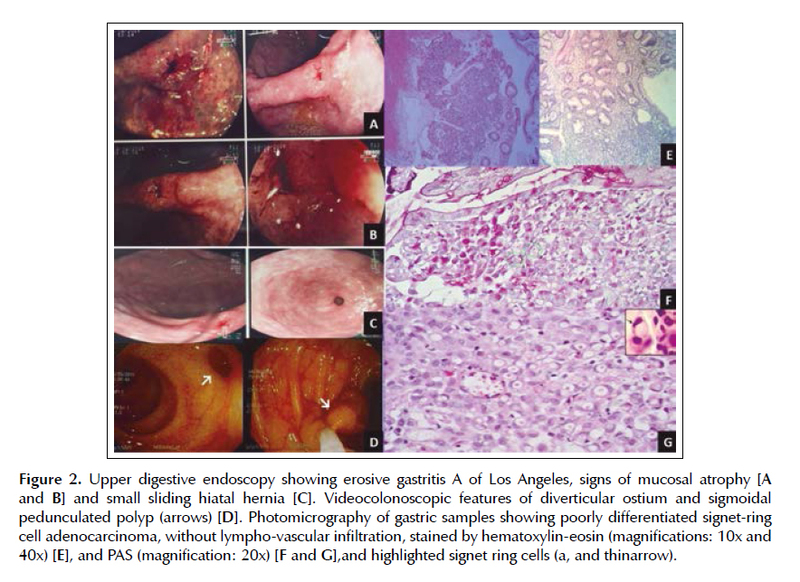 Upper digestive endoscopy revealed erosive gastritis A of Los Angeles, a depressed type IIc lesion at the angular incisure (~ 1cm), and signs of antral mucosal atrophy (Figures 2A and 2B); small sliding hiatal hernia (Figure 2C). The videocolonoscopic study showed the ostium of large diverticula and a pedunculated sigmoidal polyp (Figure 2D). Although angiodysplasia was not found by endoscopy, this change could not be discarded. Histopathologic analysis of samples from the IIc lesion showed typical features of a poorly differentiated signet-ring cell gastric adenocarcinoma, and absence of lympho-vascular infiltration (Figures 2E to 2G). Polyp samples showed tubular adenoma with marked atypia and the surgical margins free of tumor. PET-CT evaluation detected parietal thickening in gastric cardia and fundus with moderate increase in metabolism consistent with primary neoplasm; small lymph node around the cardia with no significant enhanced metabolism; and small non-calcified nodule in the left upper lobe apicoposterior segment, without significant increase in metabolism (Figure 1D). After the PET- CT corroborating previous findings, an endoscopic surgery was hypothesized; but, before the surgical approach, the patient abruptly died of a possible tumor complication. Trousseau’s syndrome was the most probable mechanism of sudden death in this case; nevertheless, the necropsy study that could confirm this cause of death was not authorized. This 71-year-old man with established diagnosis of SRCGA presented with concomitant clinical and imaging features strongly consistent with the uncommon entities  ST and HS (1-6). He had digestive bleeding, hiatal and inguinal hernias, diverticula, arterial hypertension, malignant polyp, and antecedent of smoking, lung tuberculosis, and surgical correction of aortic valve stenosis. Before underwent the scheduled endoscopic surgical procedure, the patient suddenly died. With respect to the diagnosis of ST, this was established by hiatal and inguinal hernias, gallbladder change, colonic diverticula, in addition to aortic aneurysm (3,4). Although some authors commented a possible inverse relationship between herniosis and malignancies (3), the patient herein described presented both gastric and sigmoidal cancers. Therefore, further prospective research should be performed to better elucidate this question. The occurrence of intestinal bleeding and iron deficiency anemia in an elderly patient who underwent surgical correction for aortic valve stenosis strongly suggest the possibility of HS. The lack of confirmatory result of the test for secondary type 2A von Willebrand disease was not considered a concern in this case, because the aortic gradient was lower than 50 mmHg (6). However, a possible limitation could be the presence of more common causes of anemia due to intestinal bleeding as erosive gastritis, hiatal hernia, gastric cancer, and large bowel polyp. Colonic diverticula are common in elderly and 60% of colonic angiodysplasia are found over the age of 70 years; as they can occur concomitantly, one could not rule out HS in this case (8). Worthy of note was the sudden death of this patient with a SRCGA, during a preoperative stable clinical condition. As the necropsy study was not performed, the most probable cause of death could not be confirmed - a thromboembolic event due to Trousseau’s syndrome (1). Gastrointestinal malignancies have been associated with diverse paraneoplastic conditions, either isolated or characterizing symptom complex entities, but ST and HS are not included. The coexistence of malignant tumors with these unrelated benign uncommon conditions may be merely casual, but further studies may clear possible shared pathophysiologic mechanisms. 4. Dos Santos VM, dos Santos LAM. Saint’s triad. J Endocrinol Diabetes Obes. 2016;4(3):1094. 5. Santos VM, Yano VM, Alves da Cunha GLQ, Duarte ML, Soares VVP, Boggio LF. Yellow nail syndrome, Phrygian cap gallbladder and Saint’s triad? Case report. MED UIS. 2015;28(3):387-91. Dirección: Armed Forces Hospital. Estrada do Contorno do Bosque s/n, Cruzeiro Novo. CEP 70.658-900, Brasília-DF, Brazil. Teléfono: #55-61 39662103. Fax: #55-61 32331599.